A big thank you to Donna Sharrett for lending her expertise in planning and preparing the garden! These are some of the photos that Donna took this Thursday at 601 Tully as everyone worked to prep the land and add compost. Mackenzie Winne's Powerpoint on artist David Hammons is here. 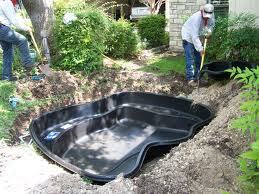 I did research on fountains and also did a little research on ponds for zone C in the back next to the ramp. My first thought was a standing fountain so that it could interact with the people standing or sitting on the top deck of the ramp. After looking at the sight and the materials we would need for a fountain I wasn't sure if this was the best idea. 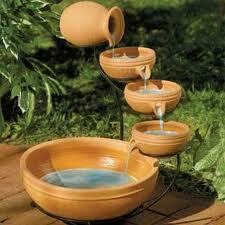 I started looking at other types of fountains that would be easier for us to make that would be more cost efficient. I thought the cascading fountain would be nice and that we could make the bowls out of the hypertufa. I also thought that a nice rock pond or fountain like the one above would be pretty easy to make and rocks are an easy material to find and work with. Having built a small fountain and pond in my own backyard I know that it's pretty simple and gives a different element to the garden. 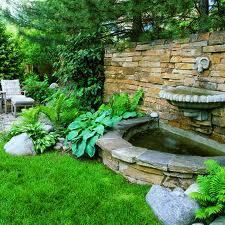 I like the idea of having a water element in our garden and think this place in the garden would be the best location. 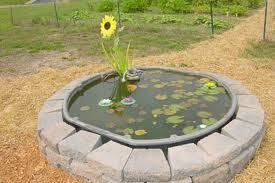 I also started thinking about ponds with coy fish. I thought the children might really enjoy looking at the fish and it gives the water element to the garden and again pretty simple to make on our own. The following lists are composites of Piet Oudolf's 27 favorite Perennials (http://www.finegardening.com/27-perennials-with-long-lasting-appeal.aspx) and the native plant list that Donna sent us. I'll try to get the powerpoint up later today. Please look carefully at his website before Wednesday and his various projects so we collectively have a sense of how we want our garden to look and how we might consider forms of plants. Check out those sculpted hedgerows! plant Aster linarifolius (Stiff Aster) in the center of the container. Its foliage resembles Rosemary, and its blue petals and yellow corona will be a welcome sight in early fall. On one corner, you could plant Campanula rotundifolia (Harebell). Its delicate and dark purple flowers bloom in early summer. On the opposite corner, you can use Antennaria virginica (Shale-barren Pussytoes) with its silvery rosettes of fuzzy leaves. Iris verna (Dwarf Iris) can be planted at another corner. Its purple flowers appear in early spring. And finally Meehania cordata (Meehania), with its one-inch pale blue flowers, could be placed at the last corner and allowed to spread over the sides of the container. Also where can we get bicyle frame/wheels for our back fence. Our neighbor Steve might know. Considering the small amount of space we have available, I think that hexagonal structures could be useful to make the most of it. Rain gardens form a subtly concave, curved, oblong section of the land where water drainage collects, like the kidney of the garden. Planting deep-rooted perennials prevents soil erosion,very picturesque. Yesterday, after our hypertufa casting, some of us had conversation with a resident who lives near the Oswego/Tully intersection and he has a great rain garden going on. 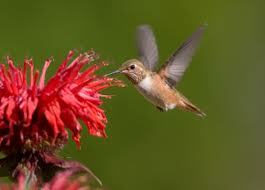 its pollen attracts helpful pollinators. and just because of its serendipitous name. ...they can yield results that go beyond a particular artifact. These transformations involve dealing with larger patterns, including patterns that may not be visible and patterns that vary over time...New landscape elements can become niches for species forced out of their original environment. how to intergrate it into the garden - both reveal its beauty in material and design and integrate it within landscape as a whole so it does not stand apart as handicap ramp. 1. Year roundness - season appropriateness of plants - 4 season beauty. What can you plant in your hypertufa container? One thing I have done with my smaller containers is to plant individual species, especially ones that are difficult to sustain in a garden situation. Draba ramosissima (Rock Twist) is a beautiful plant that grows on shale barrens. It is truly one of our alpine species from the Allegheny Mountains, and is not well-known among native plant enthusiasts. From a four-inch bun of tight foliage, it produces sprays of tiny white flowers that resemble Gypsy’s Breath. Quite often, the seeds will fall into the soil mixture and produce seedlings the next year. Native sedums are also excellent choices. Sedum ternatum, with its dark green foliage and bright white flowers, will fill a container and droop nicely over its sides in a shaded spot. Sedum glaucophyllum, which has a lighter green foliage and cream-colored flowers, will perform similarly but can take a little more sun. And Sedum telephioides, with its glaucous leaves and pink starry flowers, will reach a foot in height. If you construct a container that is a minimum of one foot by two foot in size, you can create a small habitat for several different species. One example would be to plant Aster linarifolius (Stiff Aster) in the center of the container. Its foliage resembles Rosemary, and its blue petals and yellow corona will be a welcome sight in early fall. On one corner, you could plant Campanula rotundifolia (Harebell). Its delicate and dark purple flowers bloom in early summer. On the opposite corner, you can use Antennaria virginica (Shale-barren Pussytoes) with its silvery rosettes of fuzzy leaves. Iris verna (Dwarf Iris) can be planted at another corner. Its purple flowers appear in early spring. And finally Meehania cordata (Meehania), with its one-inch pale blue flowers, could be placed at the last corner and allowed to spread over the sides of the container. Growing native plants in hypertufa containers will become a new and fascinating gardening experience. You will be able to enjoy the beauty of plants that grow in diverse habitats and are not often seen by gardeners. Your choices of what species to grow is limited only by your enthusiasm and the size of your hypertufa container. A link to a powerpoint by Patrick Courtney and Lionel Bowie about vertical gardens is here. Serra is considered a part of Postmodernism, and post-minimalism/process art (process and materials made explicit in final product), objects being about what they are: wood is wood, steel is steel, they are aggressively their material. Their construction is also true to their material. Things like joints, clips, gluing, welding, etc. falsify the impression of the real balance and weight of the materials. Serra’s work forces itself uncomfortably on the viewer. They dictate paths around them, incite fear and danger. The steel walls overpowers anyone in range. I don’t think this aggressive nature of the work would be ideal in a community garden, but, I think we can take cues from his unapologetic approach to creating. The materials we find and utilize will be unapologetically themselves, and, if we tie in this aesthetic with the permaculture, the raised garden beds and placement will be designed with the permaculture ideology in mind. I like that the ramp largely cuts into the garden area, because it already brings to mind some of Serra’s work, in that it is defensively itself; it forces the viewer to deal with its presence, to walk around it, etc. If Serra’s goal was to force the viewer to deal with his artwork in a public space, and he aggressively pursued and designed that goal, and we can take from him that if our goal is to provide a comfortable sitting area/garden for the community, then we will pursue that as unapologetically as he did his goals, and the materials we use will be true to their own materiality. 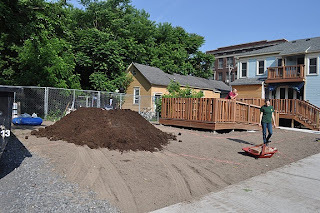 The visual tie between Serra’s work and permaculture gardening can also be seen in the raised bed gardens.Many of Serra’s pieces look like some of the spiral or keyhole gardens that have been scaled up and stripped of their foliage and dirt. Even if we don’t fully utilize the benefits of keyhole & spiral gardens, I like the aesthetic of them, and how they relate to Serra’s sculptures. Also, Serra's drawings reminded me of vertical gardens, which I think would be a great way to add privacy to the west side of the lot, between the building and our neighbor. Permaculture: sustainability, low maintenance, little waste, overall planning to solve problem (bigger picture), allowing the land and plants/life to do what they naturally do (growing patterns, etc.) and having that feed into other parts of the implemented design. Permaculture is an approach to designing human settlements and agricultural systems that are modeled on the relationships found in natural ecologies. 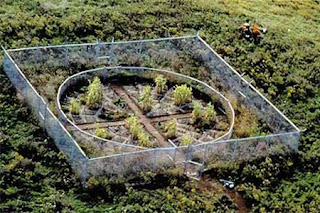 Permaculture is sustainable land use design. This is based on ecological and biological principles, often using patterns that occur in nature to maximize effect and minimize work. . Elements in a system are viewed in relationship to other elements, where the outputs of one element become the inputs of another. Within a Permaculture system, work is minimized, "wastes" become resources, productivity and yields increase, and environments are restored. 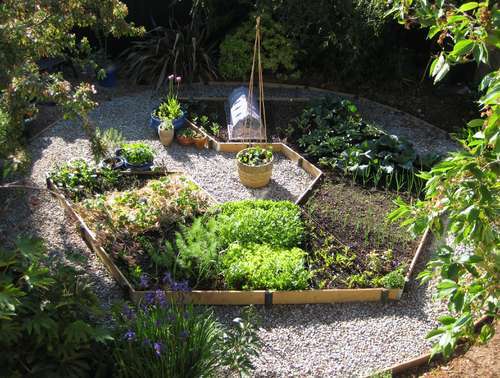 Permaculture principles can be applied to any environment. A link for an image-only powerpoint is here. A PDF on keyhole gardens is here. 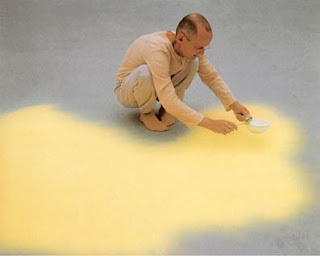 Wolfgang Laib is an artist interested in the materials of nature: pollen, milk, marble, beeswax-- materials he did not create. 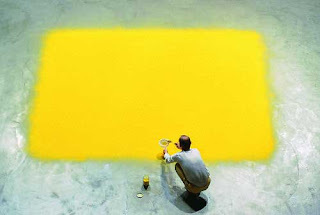 He uses these materials in concentrated forms, and by doing so, he abstracts them; he calls attention to them not as they are in nature, but as they are outside of the context of nature. In this way, his art honors the purity and beauty of the natural substance. He is also interested in serenity, in ritual. The collection of pollen for his pieces is both painstaking (taking months for a small bottle) and meditative. Similarly, his milkstones (white marble with a slight depression that is filled with milk) have to be emptied and refilled slowly each day, a ritual that endures in the hands of museum staff when he is gone. A garden in and of itself, the human ordering of organic materials for beauty and peace, and the ritualistic care a garden needs, matches up with Laib's principles. So we can't really go wrong. In designing a conceptual garden that aligns a little more specifically with Laib, I was interested in creating that sense of serenity. Rather than having many loud colors, I suggested committing to a very simple color palette for both our flowers and the structures we have in the garden, e.g. the boards for the raised beds, the fence, and planters. I suggested that we paint as much as we can white in an attempt to create the equivalent of an outdoor gallery space. One concentrated area of color at the heart of the garden (I was thinking of a monochromatic raised garden bed, possibly yellow) would then create a focal point, inspiring calm contemplation. Paths and seating around the bed would encourage people to use the garden as a place of respite. In future years, the white structures could be repainted by the neighborhood children or the next group of students. This concept for the garden, like many of Laib's pieces would be fragile, ephemeral, and could give way to future visions of the garden. I also suggested an area where children could play with some of the materials Laib would approve of--whether it's sand or rice or dried beans. Art and nature are inseparable. 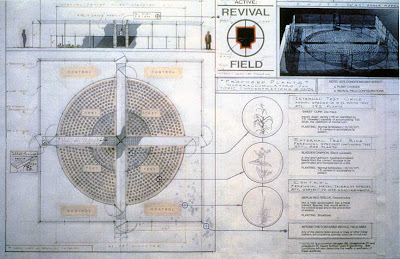 Diagram: Mel Chin's "Revival Field"
alchemical work of modern art, ecology and community engagement. 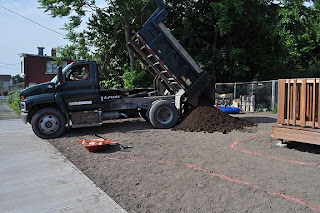 To begin to solve the current state of the garden space, I propose soil testing and the installation of a 3’ x 3’ working bioremediation of the soil in situ, via phytoextraction processes that are appropriate. 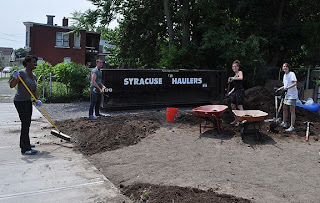 This “Foundation: Flux”, along with the construction of raised beds and container gardens will create a functional and aesthetically pleasing use of the 30’ x 30’ landscape behind the mahogany ramp attached to the building. The intention is to make a physical investment in the actual terra firma of the Near Westside that will also introduce the invigorating concepts of soil as artistic medium and “plants as sculpture” as displayed in the work of the contemporary conceptual artist Mel Chin. “Sculpture as an evolutionary process” is a lens through which to approach the 601 Tully re-vitalization project and in terms of this, an homage to “Revival Field: Projection and Procedure” is very apropos. “Foundation: Flux” will be a testament to the creative work that is in a long-term state of improvement. Much smaller in size than “Revival Field” but just as concerned with stewardship and site-specificity “relates to my interest in alchemy and my understanding of transformative processes and the mutable nature of materials. The contaminated soil is transformed back into rich earth, capable of sustaining a diverse ecosystem.” A scaled down version of Mel Chin’s project along with the raised beds, will indeed project the fact to residents that 601 is a danger zone no more. Potentials for the site: used by students from Blodgett and other visiting educational groups as a practicum site (and as an ongoing homage to “Revival Field” and Mel Chin as a politically engaged artist). Bringing (col)laboratory skills to use outside. Local experts will to teach and train students in sustainable ecology, political ecology, and/or eco-art. 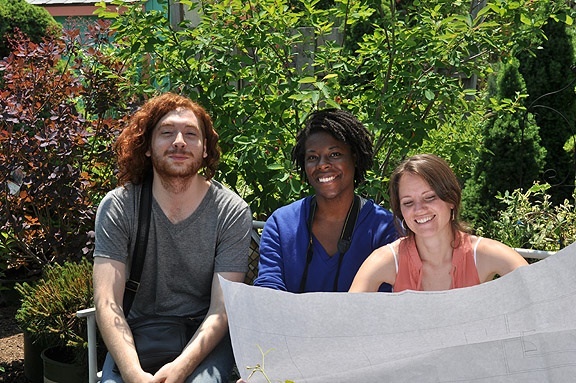 An extension of the “Art, Ecology and Community” course, in effect, blurring any institutional boundaries. Furthermore, I propose that the site be used to train youths for jobs and internships in the green industry by showing them how to take proper soil samples as well as the harvesting, drying, incineration and analyzing of the plants used in remediation. This view also recalls Joseph Beuys’ statement on the “nature” of his art not being “fixed and finished processes continue..” Both Beuys and Chin are artists who use earth as the medium, as prima materia (universal). There are scores of others who make art out of the earth. In terms of authorship, 601 Tully will have multiples. “Plants are the new sculpture” Mel Chin, 1989. Situated in the Pig’s Eye Landfill in St. Paul, MN, another one of America’s Superfund sites (styes), “Revival Field” 1990-1993 grew out of Mel Chin’s desire to “carve away” at the earth as a traditional sculptor would use a reductive process to chisel wood or marble. 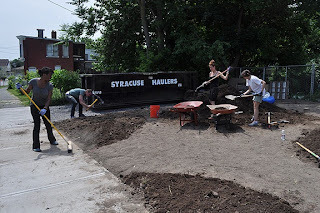 The piece is a 60 square foot section of landfill that is being bioremediated via phytoextraction using several different hyperaccumulating species of plants, including a plant sacred to the Iroquois of the Northeast--sweet corn. Chin, seems to have been fascinated by jimsonweed originally; however, under the guidance of the botanist Rufus Chaney, discovered other dynamic accumulator species work best to remedate, Alpine pennycress being the best working species for “Revival Field”. 7,000 in stock and 35,000 digital publications are available through the National Service Center for Environmental Publications (NSCEP), and the EPA's National Environmental Publications Internet Site (NEPIS) database! Search, retrieve, download, print and/or order EPA publications from this site.